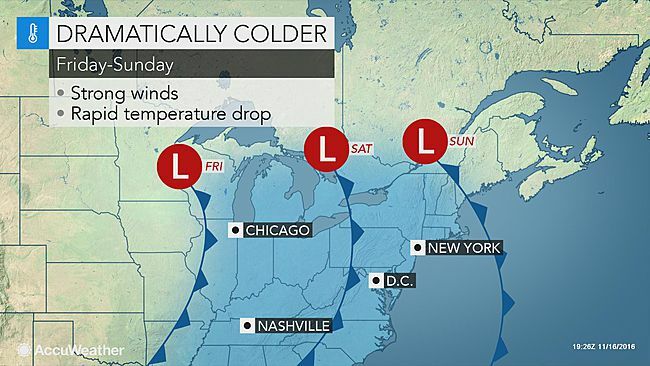 The first major blast of cold air will sweep across much of the northeastern United States this weekend and will be accompanied by snow and strong winds in some areas. The same storm set to bring the first heavy snow and blizzard conditions of the season to the northern Plains into Friday will turn eastward this weekend. Cold air wrapping around the storm will slash temperatures by 25-50 degrees Fahrenheit in about 36 hours from the Midwest to the mid-Atlantic. More than half of the temperature plunge can occur in the matter of a few hours. Temperatures in Pittsburgh, Cleveland, Morgantown, West Virginia, and Buffalo, New York, will plummet from the 60s and 70s on Friday to the upper 20s and lower 30s during Saturday night. Then, temperatures may recover by only 10 degrees or less on Sunday. The transition to cold air will be slightly less dramatic along the Interstate 95 corridor of the mid-Atlantic. However, strong winds will mark the approach and passage of the leading edge of the cold air. In coastal New England, the bulk of the cold air will not arrive until the end of the weekend, but cold and blustery conditions will make their presence known during Sunday night and Monday. Throughout the region, AccuWeather RealFeel® Temperatures will plunge to 10 to 15 degrees lower than the actual temperature before the weekend draws to a close. Fallen leaves will be whisked away and loose items in the yard can become projectiles. Gusts can be high enough to break tree limbs and cause sporadic power outages during Saturday night and Sunday. Snow will fall across the Appalachians and eastern Great Lakes as the cold air will catch up with moisture lingering across the area. The snow will begin in some areas as early as Saturday evening. 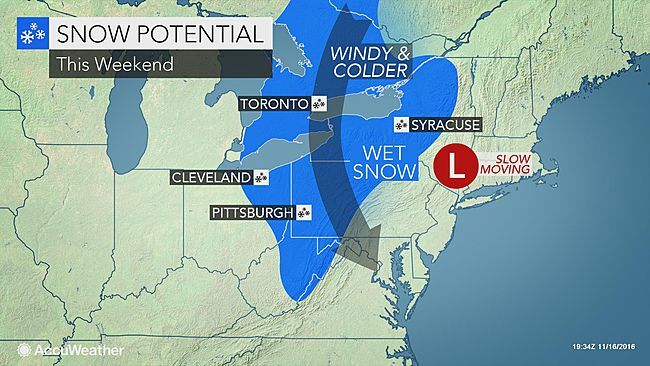 "While the exact timing of the snow is questionable this far out, we expect snow to develop over West Virginia and expand northward across western Pennsylvania, northeastern Ohio and western New York during Saturday night and Sunday," according to AccuWeather Senior Meteorologist Brian Wimer. Roads will transition from wet to slushy to snow-covered over portions of I-68, I-70, I-80, I-90, the Pennsylvania Turnpike and other highways within and along the western slopes of the Appalachians during the second half of the weekend. Motorists should be prepared for rapidly changing road conditions and visibility due to the sudden temperature drop, gusty winds and heavy nature of the snow in some locations. Even as moisture from the storm leaves, the first significant lake-effect snow event of the season will develop off lakes Erie, Ontario and Huron and continue Sunday night and into Monday. Not all of this snow will diminish after crossing the Appalachians. "The first snowflakes of the season may occur from parts of north-central Maryland to southeastern Pennsylvania and northern New Jersey," Wimer said. "But people should not expect any accumulation outside of the mountains." Beyond the wintry blast, winds will ease and temperatures will slowly moderate from Tuesday into Wednesday. However, another storm is likely to swing into the region on or before Thanksgiving Day.